As I eluded to last week, I've got another free tool for you. The Tab Extender is an AjaxControlToolkit based extender that allows you to easily add tab key support to any ASP.NET textbox. This extender is being used on the new Code Converter to provide tab key support in the upper code input textbox, so you can check it out there to get an idea of what it does. 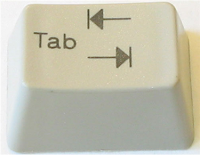 Using the Tab Extender is easy. On any ASP.NET AJAX enable website (with the AjaxControlTookit assembly in the bin), just add the Tab Extender assembly to your bin and drop a "TabExtender" control on your page. Set the "TargetControlID" of the Extender to the ID of an ASP.NET textbox that you want to add tab key support to and run your project. You'll now have a textbox that allows you to format contents with the tab key. The download includes the full Extender source and a demo website showing the Extender in action. Check it out today and be sure to share your improvements if make any!